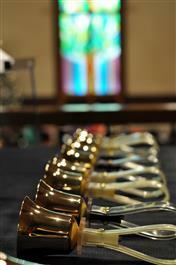 The bell choir at St Paul is not your ordinary bell choir. You don't have to know what a martellato ring is. As long as you can bonk the bell on the table or whip, swirl and swing you can hang with the Bellmeisters at St Paul. Their techniques may be identified as unconventional, but they sure do make some wonderful music through the fellowship of rehearsing creative arrangements and performing on Sunday mornings for the congregation. ﻿Whether it's the acapella interlude to a traditional hymn, the four part harmony of a beautiful anthem, or the contemporary praise in unison the voices of the St Paul choir are amazing. There is no challenge too great for the beauty of worshipping the creator through singing. The choir is accompanied by Terri Trepp, an accomplished pianist and organist with a passion for the music at St Paul. The choir sings regularly for worship and enjoys the opportunity to praise the lord in song. Music is a light in a world that can seem so dark and disconnected from the light of our Lord and Savior. Contemporary praise music continues to bring many to know Christ through a connection with the world that is difficult to reach through tradition and structure. St Paul is blessed to be able to praise the lord through traditional and contemporary worship. When the praise team leads the congregation in song the smiles light up on the faces of each and every person, and a connection with our Creator is celebrated.